We are off to France this Sunday for our 20th Wedding Anniversary. Yippee we are so excited and traveling sans enfants, of course. Only fitting too, since the last time we were in France we were on our Honeymoon. My french was terrible then, perhaps a bit better now, however a long long way to be considered half way fluent. Sigh. That’s the trouble with being Canadian (well American now as well), is that people assume that I speak French as if it was my first language – Ha. It does improve though with a few glasses of wine! I do plan to keep working on it since I have nothing to lose at this point, and I can add it to a few other things I one day hope to master – at this point the list is getting quite long. To get in the French frame of mind what would be more appropriate for dinner then a ratatouille? Very French n’est pas? Also very opportune. I was able to use one more zucchini from the garden!! Add pork to large bowl and coat with bbq sauce and rosemary. Let sit 10 - 30 minutes. In large skillet add olive oil and onion and sprinkle with salt and pepper, cook 3-4 minutes. Add eggplant and peppers and continue cooking a few minutes. Now add zucchini and tomatoes and rosemary. Cook stirring occasionally for an additional 10-15 minutes. In the meantime start the bbq and set it on high. Add pork and turn down heat to med-high. Treat pork as if it has 4 sides, cooking each side 3-4 minutes. Then turn heat down to low and set pork on top rack and cook another 3 minutes or until internal temp is 145. Remove from heat and let sit loosely covered with foil for 5 minutes, internal temp should be 150 at time of serving. 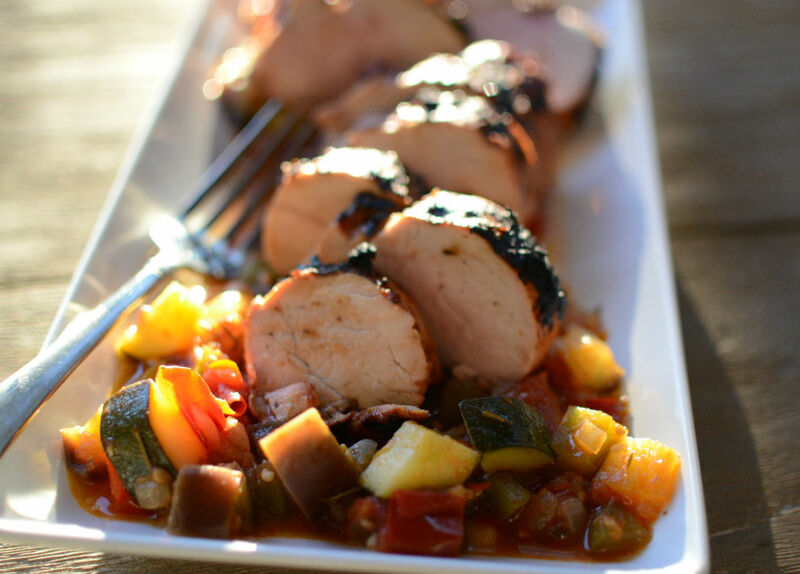 Lay ratatouille on large platter and place carved pork on top to serve. Have a great time Pamela!